Near the Southern tips of Angola, reside the Mbalantu tribes of Namibia. Mbalantu women are known for their headdresses. At the age of twelve, young girls in Mbalantu tribes begin preparing their hair for the headdress. When young girls reach the age of sixteen, their Fruit pip headdress is discarded and replaced with one of sinews. The style is again changed once the girls reach their Ohango Initiation ceremony. The hair is then styled in 4 long thick eembuvi braids. Once the girls make it through their initiation ceremony, they are considered ovafuko (brides) and then an additional layer of tree bark and fat is applied to their hair. The hair is later taken up and styled into elaborate headdresses throughout their life. 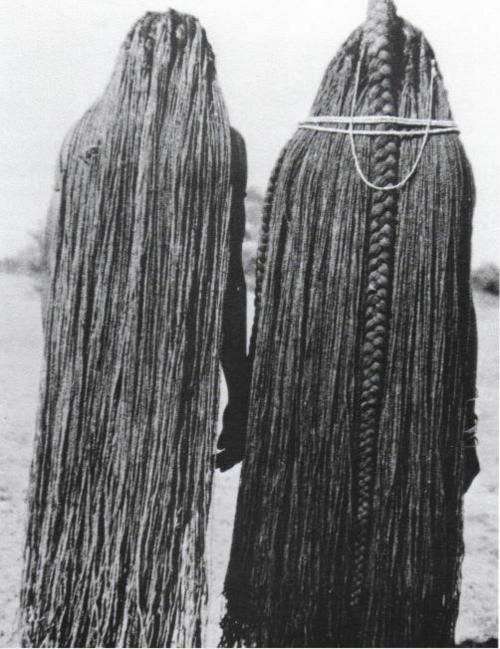 Just goes to show you, Long hair don’t care isn’t anything new.